Learn about a physical machine from a century ago that follows many concepts of a modern web framework. Blackford: Dr. Hanson, I presume? Hanson: Yes, nice to meet you. 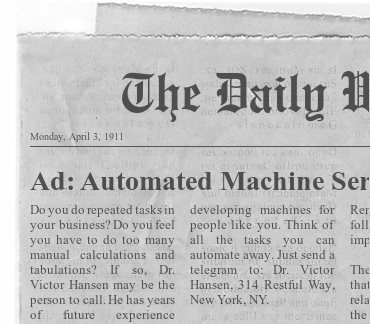 I can now tell you about my automated machine services. I built machines that can calculate and tabulate numbers, but I'm thinking of branching out into other areas. What kind of machine do you need? Blackford: I'm tired of dealing with the same manual tasks while running my store. It would be nice if a machine could just take over various operations for me. Though I'm not sure how that would be possible considering our pre-digital age and all. Hanson: Nothing to worry about, I can create analogue machines. Now what specific requirements do you need in your machine? Blackford: Well it would be nice if I could receive some automated help to keep track of all inventory, process transactions, display brochures to customers, and maybe hand them products from higher shelves too. Hanson: Not so fast! Let's focus on the most essential features you need first and later we can improve it. What is the most basic important thing you are looking for when shopping for automated store-running machines? Blackford: I guess some way to keep track of all my inventory. Hanson: OK, so let's focus on that. What exactly do you want the machine to do to track your inventory? Blackford: I guess it should let me create inventory records and store them well. I should be able to access them at any time to read them, update them, or delete them. And it should keep track of how much inventory I have, and let me modify the data when I get a new delivery or sell an item.